ADT produce a comprehensive range of composite hose assemblies capable of handling all kinds of transfer applications. ADT offers an extensive range of end fittings, normally supplied to customer requirements. Our end fittings are available in a variety of materials including gun metal, stainless steel, aluminium and polypropylene. 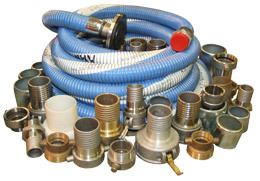 Our range also includes quick release couplings, adapters and accessories. All composite hose assemblies manufactured by ADT are pressure tested to 1.5x working pressure and a test for electrical continuity is carried out. A test certificate is then issued.